Men"s scarf today is uncommon. In a business situation it replaces a tie in informal knit scarf. However, the scarf is the best complement costume of any style, make it a truly elegant and distinctive. 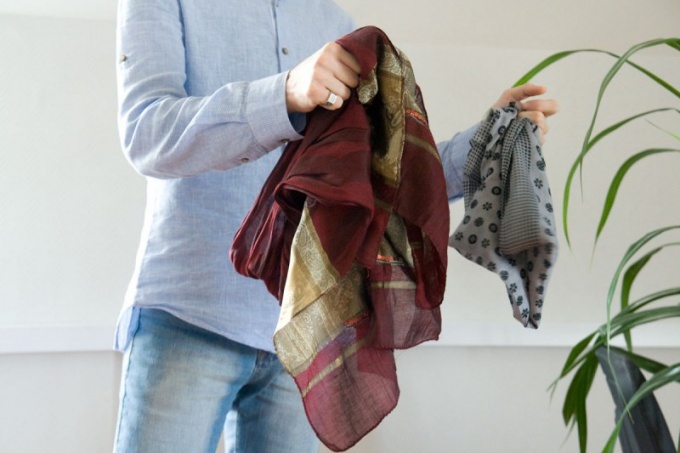 Try on some scarves, try to wear them with different items of clothing – and you will surely find the option that you like. Try a cotton handkerchief with a colored shirt. It can be plain, striped or plaid, worn untucked or tucked under the belt. Pick up the handkerchief interesting shade – plain or with a small gasket. Take it in both hands with the ends folded diagonally. Quickly twist the handkerchiefso that he was curled up in a tight tourniquet. Tie it around your neck, leaving the knot under the chin or on the side. Folded thus the handkerchief and decorate a plain sweater or pullover. Folded wrap a tourniquet around the neck, crossed the ends back and tie in front of the little double knot. For more special occasions add a neck handkerchief cuff links unusual shape. Tuck the sleeves of the sweater or cardigan to showcase the cuffs of a shirt in all its glory and to give all along a touch of irony. Nice to slip in your pocket lapel scarf, designed in shades of Kara, tied on the neck. Cozy casual style – jeans, suede boots, tweed jacket or soft cardigan – complete with all the convenience of a wide scarf with fringe. His sloppy tie knot, pulling it under the chin or lower down, to the chest. As shawl suitable arafatka, or wool rectangle with brushes. Add horn-rimmed glasses and perfume with woody notes – the image of a prosperous intellectual pleasure ready. Voluminous shawl made of wool or viscose will replace the traditional warm scarf, which is worn with a coat. Pick the soft fabric of the dark, deep colors, plaid or with a pattern "Paisley". Fold the scarf diagonally fold the scarf in half lengthwise. Wrap it around the neck, throwing one end over your shoulder. A suit in the English style will complement a cigar and a cane umbrella. Evening costume can be supplemented with a wide silk scarf, knotted in the manner of a tie. Fold it in half in length, attached to the neck and tie a wide knot, extending one end of the scarf through the loop formed at the other end. Spread your scarfto make it look more voluminous. Looks very elegant tie, combined shade with shirt, vest and suit. Soak the image in cream-beige or steel gray colors. In the pocket of the jacket add casually rolled handkerchief – this will make your costume more stylish.